The SBU is an electric self-balancing unicycle. It controls the forward and backward balance while the rider balances left and right. It's a unique blend of machine and human balancing. The rider controls the speed by leaning forward or backward to speed up or stop. There is no need to pedal, in fact there are no crank arms, just foot rests. The SBU keeps upright by utilizing advanced electronics including accelerometers and gyroscopes with sophisticated balancing algorithms. A limited release of ten SBUs is slated for early November '08. For this initial production cycle, the cost will be $1500 each. The first ten buyers will be selected based on first contact date and a brief phone interview. Rinspeed, a boutique automotive design company, plans on blowing away the upcoming Geneva auto show with its sQuba concept, a car that swims underwater, drives autonomously on land, and is emission-free. 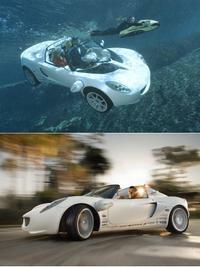 The car, based on a Lotus Elise, uses an electric motor to drive the wheels on land, plus two other motors to drive propellers underwater. 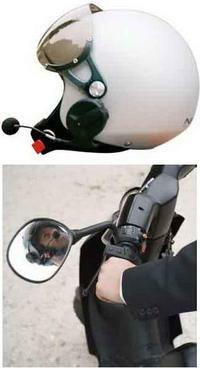 Parrot a well known name in wireless technology have released a Bluetooth enabled headset for motorcycles. Known under the name Parrot SK 4000, the Bluetooth headset is meant for single use (i.e. no intercom), connecting to a Bluetooth equipped mobile phone. They also offer a FM RDSRadio Data System, or RDS, is a standard from the European Broadcasting Union for sending small amounts of digital information using conventional FM radio broadcasts. The RDS system standardises several types of information transmitted, including time, track/artist info and station identification. RDS has been standard in Europe and Latin America since the early 1990s, but less so in North America. stereo radio within the unit. The radio can be managed using a remote controller that can be fixed to your handlebar. The remote controller communicates with the helmet unit using wireless RF. The Parrot interface allows for the use of voice dialing. The Parrot has a voice recognizing software that will dial the number of the person whose name you pronounce. No voice training is required. You can "walk" through your dialing directory using the remote control, the Parrot will "read" out the names to you. The same applies to the FM radio, the Parrot will tell you which station you're listening to (if the station is RDS enabled). The battery will last 10 hours while blasting away music, so enough for any long trip. In standby, the battery will last 600 hours. It takes 3 hours to fully charge the unit. If you (or friends) need to use a PC while driving, the "In-Car PC" should do the trick. This system features "integrated media libraries, multiple screens and web access from any seat." 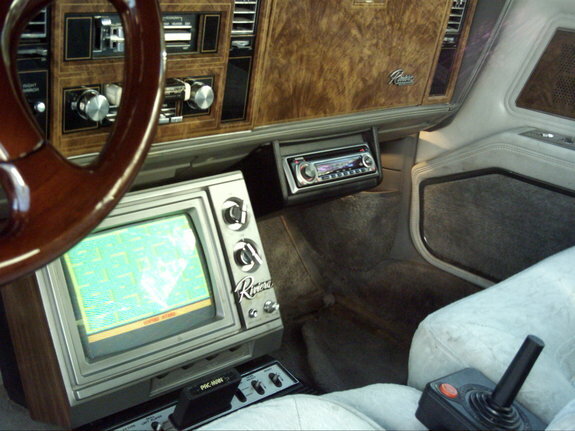 This concept isn't new if you watch "Pimp my Ride", but the in-Car PC makes it more attainable. Each system’s fully customisable, with the option for satnav, hands-free phone, DVD, web access and music libraries built in. The system can run with up to four separate screens, and there’s even the option to fit a scanner and printer in the boot! T3 takes a trip with the In-Car PC. Why not arrive at your next tailgate party in style? 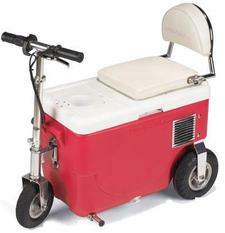 This ride-on cooler not only speeds you along to your destination, it’ll keep your drinks and snacks nice and chilled on the way. This rechargeable electric scooter holds up to 24 cans of your favorite beverages, along with 8 pounds of ice right under your bum. There’s even a cup holder right between your legs so you can have a can of the cold stuff for yourself. If sitting on a cooler doesn’t sound very comfortable to you, there’s an optional padded seat that bolts on for about $30 as shown. 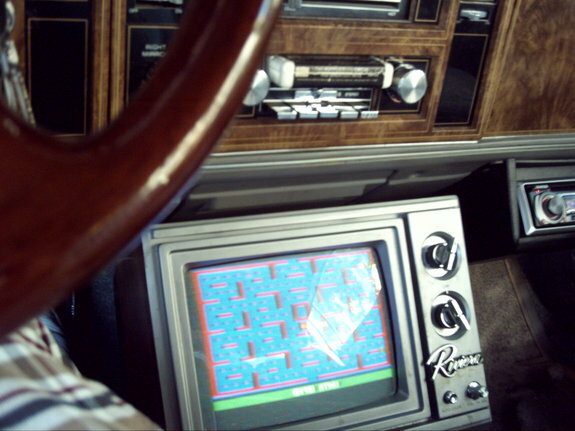 Kevin Upgraded his 1978 Buick Riviera Old School Style with an 8 track, 13" TV, and Atari for his entertainment. Not only is this a sweet looking bike but it comes ready with iPod connectivity - with music navigation controls smartly placed on the handle bars while tracks can be viewed on the dashboard. 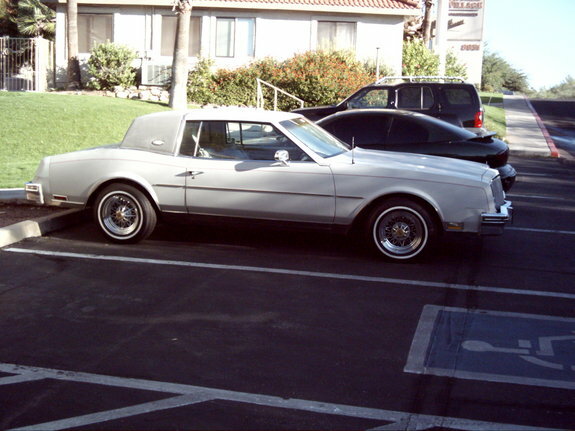 The premium version also has a 4 speaker system, and you can have XM radio thrown in as well. I’ll take one in grey please.